GEORGE TOWN: Penang has tabled a higher deficit state Budget of RM740.5million for the next fiscal year of 2018. 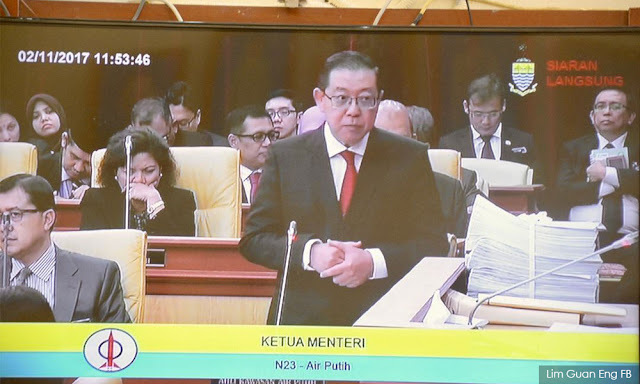 Chief Minister Lim Guan Eng when tabling the budget, stressed that it was an estimate and it can be reduced if the state records a higher revenue collection. Among some of the initial highlights for the state was a free Rapid Penang bus service during peak rush hours in the mornings and evenings. Allocations would also be given to aid the medical tourism and hi-tech manufacturing sectors. Penang has tabled a projected budget deficit of RM748.5 million for next year, compared to a RM667 million deficit for this year as administration and living costs continue to escalate. However, Chief Minister Lim Guan Eng stressed that the state has a unique distinction of tabling projected budget deficits every year yet recording actual surpluses. Next year's operating expenditure is RM1.25 billion, while the forecast revenue collection is RM503.7 million. The cost savings come principally through the open tender system and an efficient administration, Lim told the state legislative assembly today. After some 10 years of facing various external economic challenges, Lim said the state's gross domestic product is projected to outstrip the national average growth of 5.2% for this year. Penang is targeting a GDP growth of 6% this year with the main contribution coming from manufacturing and services, with farming also showing signs of promise through fish farming. GDP per capita has increased from RM33,597 in 2010 to RM47,322 in 2016, a 30% increase. Penang's GDP per capita is the second highest in the country, behind only Kuala Lumpur. From 2015 to the first half of 2017, Penang attracted a total of RM13.8 billion in approved Foreign Direct Investment (FDI). Tourism has also grown with the number of passengers at the Penang International Airport (PIA) hitting 6.7 million passengers in 2016, exceeding the airport's capacity of 6.5 million passengers. The success story in the last 10 years is reflected by annual budget surpluses since 2008, with accumulated budget surpluses over the eight year period between 2008 to 2015 reaching RM578 million. Lim also announced a range of fresh initiatives, which pundits have described as a people-friendly fiscal plan designed to endear the state government to the voters with the next general election looming near. > There is a "I Love Penang" card, which is a smartcard for all local residents that allows access to social amenities and benefits provided by the state. The public think tank Penang Institute will be the implementing agency for it, as they have been allocated a budget of RM4.5 million to produce and distribute the smartcards. > A free public stage bus service was mooted during the daily peak hours in the mornings and evenings – it is aimed at reducing traffic congestion. The project is dependent on the cooperation of RapidPenang. > Penang has allocated RM60 million to jumpstart a "Pinang Sihat" medical card programme for families whose combined household income is below RM5,000, where the state will subsidise treatment at private clinics. A medical card will be issued to each recipient, who can only spend up to RM50 per visit to a panel of private clinics who are part of the Pinang Sihat scheme. "This will help the recipients, who fall ill to see a doctor without worrying too much about expensive charges or travelling to government clinics that are far away from their homes," said Lim. > The free mammogram examination scheme for women above 35 years shall continue. So far more than 10,000 women have benefited. > The state will also be increasing the annual payouts for senior citizens and the disabled from RM100 to RM300 for next year. > A maximum bonus payout of RM2,000 will be accorded to civil servants who have a good disciplinary record while those below par will only receive RM1,000. > The state will also allocate RM10 million for hill slope protection efforts, as well as to conceive a study on climate change, and tackle illegal farming. Later, there was a protest at Komtar, led by former Penang PAS Youth head Mohamed Hafiz Nordin, who urged the state government to rescind the alleged appointment of PKR secretary-general Datuk Saifuddin Nasution Ismail as the new Penang Islamic Religious Council president, replacing Permatang Pasir assemblyman Datuk Salleh Man. Hafiz argued that Saifuddin was not a religious scholar, therefore he was not suitable for the post. Saifuddin's replied that holding protests is normal in a democracy. "Public housing shortage is serious in Penang. Badminton courts and swimming pools can be added into low and low medium-cost housing projects. Tang Heap Seng"
WHAT is wrong with an election budget? “Election budgets are happy and beneficial things for the rakyat,” said party secretary Tang Heap Seng. He, however, advised Pakatan Harapan politicians not to “criticise something but did the same themselves”. “Many Pakatan politicians criticised the Federal Budget and the Penang government did exactly the same. “They claimed the Federal Budget will help Barisan Nasional win the general election. “But then, the Penang government also gave an election budget,” said Tang during a press conference at the Penang MCA headquarters in Transfer Road yesterday. Among the Budget 2018 goodies were Childcare Aid of RM300 for Working Mothers, RM300 aid for each local vocational school students and one-year waiver of business licence for about 29,000 hawkers and traders. On the state Budget for next year, Tang said while there were many benefits, he was puzzled by the allocation of RM275mil to build 82 badminton courts and four Olympic-sized swimming pools. “While sports are crucial to a happy society, we wonder why the state paid little attention to Penang’s urgent problems. “Public housing shortage is serious in Penang. If the government wants to provide badminton courts and swimming pools, these could be added into low and low medium-cost housing projects,” he said. Penang Gerakan vice-chairman Oh Tong Keong and secretary Hng Chee Wey also issued statements yesterday, expressing bewilderment at the RM275mil allocation. In contrast, the tabled development expenditure for state Drainage and Irrigation Department is RM12.3mil. Penang Island City Council and Seberang Prai Municipal Council will spend RM20mil on flood mitigation and for hillslope protection, RM10mil was budgeted. Tang also said the RM53mil budgeted for the development of Islam was commendable, but wondered why only RM1.1mil would be given to Penang Hindu Endowment Board next year. He said Chief Minister Lim Guan Eng only mentioned that RM30mil was given to non-Islamic religious development since 2008 when he tabled the Budget. He said it would be ideal to allocate RM30mil each for the development of Christianity, Hinduism, Taoism, Buddhism, Sikhism and other minor religions yearly. In a statement as well, Penang Women’s Development Corporation applauded the RM300 yearly aid for each working mother under the age of 60 with children aged six and below through the state Budget. Meanwhile, Lim clarified that the bonus for civil servants would come from the reserved funds of this year’s Budget. Council should not bow to development or political pressure, says city councilor, Khoo ‘Politicians should be ‘wakil rakyat’ and n.
Behind BJ Cove houses at Lintang Bukit Jambul 1 is an IJM Trehaus Project. Approximate Coordinates : 5°20'38.47"N,100°16'..